In a small studio packed with sculptures made of scrap metal, Palestinian artist Ahmed Humaid has found a new medium in origami, the Japanese art of paper folding. It's an unlikely pursuit for an artist living in the Gaza Strip, which has been largely cut off from the outside world since Israel and Egypt imposed a crippling blockade on the Hamas-ruled territory more than a decade ago. But the 29-year-old Humaid, who has no regular job, says interest in origami is on the rise. "With more people asking about it, this work has turned into a source of income for me," said Humaid, who lives in Nusseirat refugee camp in central Gaza. 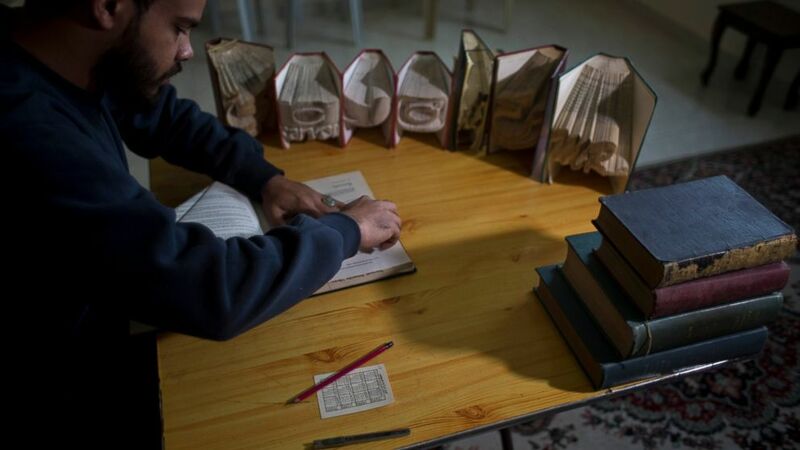 Humaid practices a form of origami in which he folds and forms the pages of an entire book into a readable inscription of calligraphic letters. He has no formal training. He said he learned about origami when he saw some photos on Instagram. He began following Japanese artists and wrote to them. Some offered help and feedback. When he made his first origami work in October, it took him 15 hours to finish. He shared the photo with some Japanese artists who acclaimed the work. Since then, Humaid has sold 45 works locally, including books folded into names that lovers have given to each other as gifts, as well as logos for local businesses. Depending on the size and number of letters, he charges 50 to 100 shekels (about $15-30) per order. Unemployment in Gaza, a coastal enclave sandwiched between Israel and Egypt, stands at more than 50 percent, according to U.N. and other international estimates. It is even higher among Gaza's youth. Humaid would like to expand his business beyond Gaza's borders, but the blockade has cut off virtually all exports, and Israel and Egypt heavily restrict travel into and out of the territory. "I wish to visit the homeland of this art — Japan — so I can be closer to the people who creatively mastered it," he said.